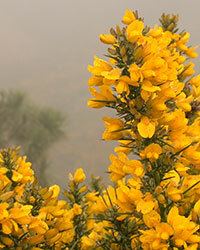 Gorse was brought to Hawaii as a hedgerow to control cattle. Now it is a major invasive weed on the Big Island and Maui. When strategizing to suppress and/or eradicate a plant species we first need to identify that species as a weed. What is the definition of a weed? A weed is identified from a human perspective as a plant species or community occupying an ecological niche that creates an undesirable effect by its mere presence. There are a number of examples where “One person's weed is another's fruit!” particularly between groups with shared borders and conflicting land uses (i.e. agriculture and conservation). How do most invasive species arrive in Hawaii? Invasive species arrive in Hawaii for many reasons, but by far the most important reason for introduction is horticultural use for ornamental purposes. In fact, this single pathway of entry accounts for approximately 70% of all documented invasive plant species in Hawaii. Other pathways of lesser importance include introductions for use as crops, livestock forage, or forestry species, and accidental introduction of weed seeds as contaminants in other products. Identify the conditions of a healthy environment and those conditions that have been altered by the weed invasion. Integrate interventions against the weed with improvements to those altered conditions of the landscape. Stabilize the ecosystem to promote the occupation of desirable plant communities to work against reoccurring weed infestations. Many weed removal operations are in effect fighting the universal law of entropy. In efforts to eradicate infestations, we create gaps or openings that provide a niche that must be occupied. If the surrounding environmental conditions remain altered that niche may continue to provide a competitive advantage to the same weed that occupied it previously. If we can integrate weed removal operations with holistic modifications to the environment we may be able to mitigate weed re-infestation (i.e. soil fertility management). Our best long-term option is to stabilize an environment by providing competitive advantages to desirable plant communities that will become resilient against the unwanted weed occupations. The mission of this web page is to provide novel examples of broad applications in weed management that are being scientifically proven to work in Hawai'i. There will be many examples where herbicide applications are the safest and most effective techniques. However, there are likely to be just as many examples where “organic” solutions give excellent opportunities for improving land management. Much of the information on this site will be work in progress, so we encourage you to check this page regularly for updates. We also encourage you to provide your own positive inputs and feedback to weed management solutions. Funding provided by: Tropical Sub Tropical Agricultural Research (TSTAR) Project no. HAW01911-ß08G. Western Sustainable Agriculture Research and Education Professional Development Program (WSARE). Renewable Resources Extension Act (RREA) Project no. 13-132. Sponsored by USDA-CSREES.